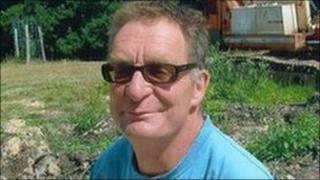 Two more people have been arrested on suspicion of the murder of a Sussex businessman at his farm. A 39-year-old man from Ashford, Kent, and a 43-year-old man from Maidstone, Kent, are being questioned. Police have already arrested and bailed seven men from Kent, a man from north Wales and a woman from Kent. A post-mortem examination found Mr Gardner suffered compression-type injuries, possibly caused when he was crushed between two vehicles. A spokeswoman for Sussex Police said: "Two men have been arrested this morning [Wednesday] on suspicion of the murder of Julian Gardner at his home in Robertsbridge on 11 October. "Detectives investigating his death believe this was a burglary that went tragically wrong. "Mr Gardner, it is believed, disturbed an unknown number of people in the early hours of the morning forcing outbuildings where he ran an agricultural and car repair business." Kent Police received about 40 calls and a large number of texts and e-mails following an appeal on the BBC Crimewatch show on 14 December. A man who claimed to be the person shown on CCTV footage on the programme was arrested and later bailed. A £10,000 reward has also been offered by police for information leading to the arrest and conviction of those responsible.